For this shoot, I decided to take inspiration from both Johanna Knauer, and Noell S. Osvald. These two photographers can be found under the 'Research #3' tab. My aim was to integrate Noell's close-up portraiture and Johanna's misty effect into one piece. Originally, I had planned to shoot with a completely dark room, using a white background and photox lamps for the flash. However, due to technical difficulties, I was forced to shoot whilst in dim daylight with the use of flash. First, I tried photographing the model normally with the lamp's flash. This image came out incredibly sharp and didn't have any 'misty' effect to it, which I'd hoped the material alone would have produced. However, I then changed the shutter speed to 2 seconds, and shook the camera whilst the shutter was open. This produced a slightly blurred effect on the majority of the image, but where the flash had lit up the material, it appeared to look like smoke. All the images in this shoot are fairly similar, however I believe that the use of changing the zoom and from portrait, to landscape, has created a unique set of images. This second photograph is from the same angle, but slightly further away from the subject. I prefer this photograph to the previous one because you can see the misty effect on the right hand side clearer. I also like how the models face is hidden slightly from the camera, only the outline being visible. I feel that these photographs represent two things. 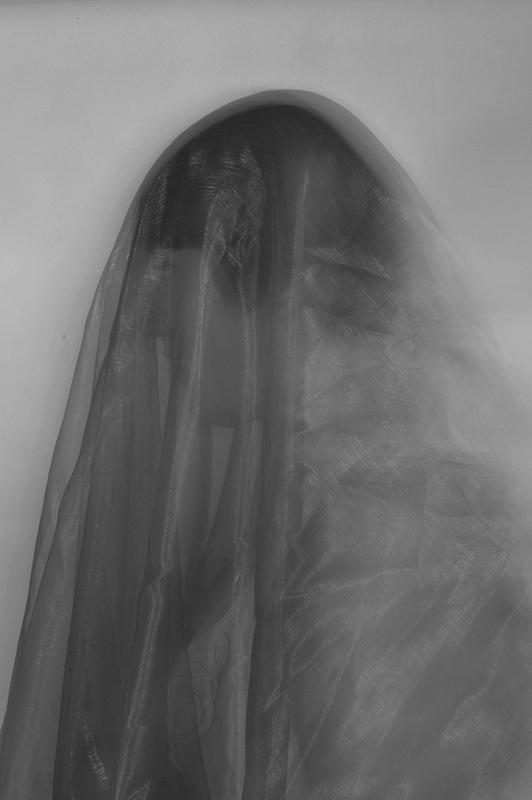 The first is my theme of disguise: The model is so deep in her created disguise that it is now difficult to see what part of the image is the model, and what is the shroud around her. The subject has become so engrossed in this farce, that she is beginning to fade away. The smoky effect of the material emphasises this interpretation. I would also like to note the layered effect above the models head, which is caused by the longer shutter speed and me shaking the camera. This makes it look as if the material is floating over her, hanging over her head much like bad thoughts and emotions can do to us in everyday lives. This third photograph was taken landscape. I chose to do this to create a rule of thirds effect on the photograph. I chose to take this photograph in landscape in order to show the full effect of the misty shroud, evaporating towards the right hand side of the image. I particularly like how sharp the material is on the models face, and that you can make out specific features such as her hairline and chin. I also like how light the background is in this photograph, giving a sharp contrast to the dark material over the models face. Once again, this could represent the theme of life and death, tying in with the idea of hiding behind a disguise/shroud in order to conceal true emotions. The use of black and white creates a very neutral image, taking any suggestion of warm colours out of the image and leaving behind shades of grey that could be interpreted in several ways. The colour grey is reminiscent of soot, which leads of onto the warmth of the fire, which is a pleasing thought, however it could also represent the ashes of a lost one - leading into the idea of death. This final image is my least favourite out of the shoot. You can't clearly make out the outline of the model beneath the material in this picture, asides from the dark patch of hair at the top of the image. However, on the other hand, it does represent the theme of life and death more than the others, looking like the traditional idea of a grim reaper. Unfortunately, it doesn't fit as well as I'd have liked into my theme of disguise. Overall, I believe this photoshoot was a complete success. I aimed to experiment with Knauer and Osvald's styles, and mix them into a overall shoot. 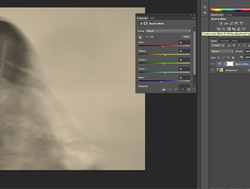 I believe I achieved this: using Osvalds idea of a sheet of material over the models face, taken at shoulder level and Knauer's idea of using a sheet to fade out into mist. 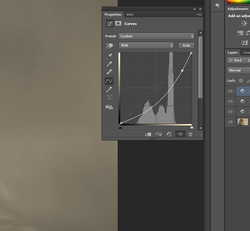 This editing process applies to all of the images. - Edited the image into black and white. - Edited curves to darken the image.